Premiere is bringing back the UGLY! 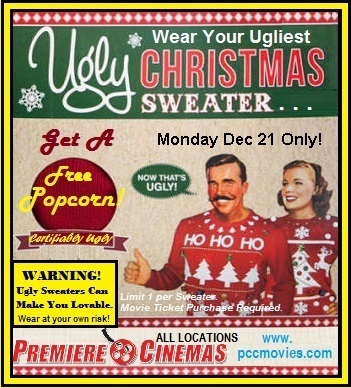 Back by popular demand, Premiere is rocking the UGLY SWEATER this Monday December 21st only for ALL SHOWS, ALL DAY! Just come see a movie wearing your UGLIEST, most garish, colorful or ridulous Christmas sweater and automatically get a free popcprn courtesy of your Arbiters of Ugly at Premiere. Even if you don't think your sweater is ugly but we do, heck, you'll still qualify! Not everyone loves UGLY sweaters, but everyone loves free popcorn, so rock your UGLIEST this Monday and enjoy our fresh hot delicious popcorn and a great movie experience at your friendly local neighborhood Premiere Cinema.